Cone Grindage, originally uploaded by TheClothMan. Cloth is annoying to clean. 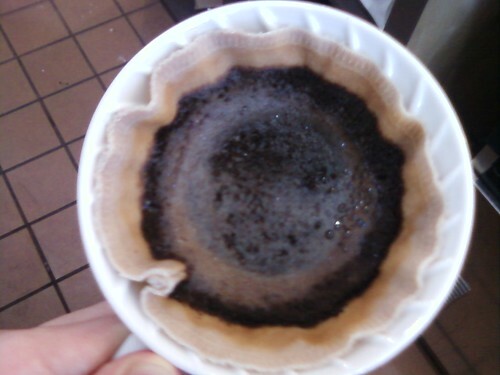 If you don't take care of the filter and let it dry out or store it improperly, it will taste like 'cloth'. If you bleach it or use harsh cleaners, it will distort or deteriorate. If you don't rinse it well, it will discolor quickly. On the other hand, it provides depth filtration so you can get a nice oily balanced and clean cup of coffee from a cloth filter. It's no more difficult than the majority of methods and needs only an additional step or two of care to keep it in good shape. What I personally find so enjoyable about cloth is the taste. The depth and simultaneous clarity that comes from using this filtration should be justification enough for any serious coffee geek to give it a spin. I guess that's what matters the most though, the taste, right? I know that so much of the coffee community is looking for the golden brewer that is simultaneously cheap, easy, and produces great quality. If they pick two of those three, it might be more realistic but there will always be room for everybody from those searching for the perfect cup to those searching for the easiest one. Cloth filters just might fall to the side of those willing to put a bit more time in to get a better cup.